30 Amp 10/3 STW 25ft right angle plug with wires on female end. 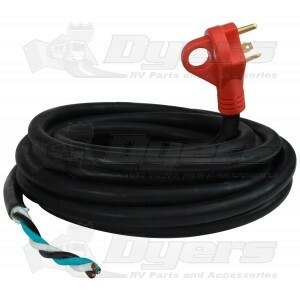 Heavy duty 30Amp RV power cord with finger grip handle on the male end. Extends power up to 25′ from the original source. Product look and feel like the factory install, like the red color of the cord end. Ash it was 5" longer.